For awhile now I’ve been wanting to play the lead solo to Stairway (studio version), which is not a particularly fast solo, but my speed just wasn’t up to snuff. After learning the notes for the first few sections right before the fast lick high on the neck, I began practicing using a metronome to slowly ramp up my speed. I’d play it slow and accurate repeatedly, then progressively faster until everything fell apart, then back off the speed a bit, then rinse and repeat, always trying to play fast and clean. I made some progress, and reached a point where my speed was better, but I felt like I couldn’t go any further. I just wasn’t fast enough. In fact, I sounded awful. Nothing felt fluid. So I started thinking my picking technique was bad. After a few months of research and testing deep in the underground billybadaxe.com guitar testing facility (actually just me sitting on a cheap computer chair in front of a linux box), I’ve found what is starting to work for me. And hopefully might help you to start to learn how to play lead solos faster using better right hand pick technique. These ideas about playing faster, better, more smoothly with better right hand technique are not mine. They are the ideas of excellent guitarists all over the net. More importantly, excellent guitarists who actually have the ability to convey clearly what proper fast picking technique looks like. Most experts in any field have a hard time telling you the exact technique that makes them great. They just do it. Which doesn’t help a guitar hack like me. I gotta have specific details. I’ve been watching youtube vids, reading websites and quizzing my guitar friends and teachers and testing this stuff for the last few months. It all started with me switching to an unanchored right hand position, but there’s more to it. Proper right hand technique is only part of the play fast puzzle. Once you’ve got good right hand technique, then you’ve got to get the right and left hands in sync and practice, practice, practice. The point of the pick should aim straight down towards the body of the guitar. The top of the pick should not be angled downwards, which makes a down picking easier and up picking difficult. Conversely the top of the pick should not be leaning up, which would make upstrokes easier and down strokes more difficult. A little too far down makes up strokes difficult. An upward lean makes downstrokes tough. If there was a line running from the point of the pick straight up through the top of the pick, it would be perpendicular to the body of the guitar, a 90 degree angle to the body. With the pick in it’s correct alignment from step one, rotate the pick 45 degrees. Your thumb should rotate downward, all the while keeping the correct 90 degree up/down angle from step one. 3. 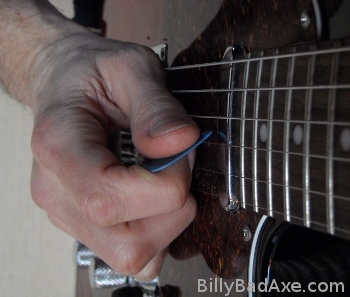 Use a thick, stiff pick. Over 1mm is a good rule of thumb. But really, any pick that doesn’t “flap” when you hit a note is fine. Thin, flexy picks take too much time bending while trying to hit a note. 4. Hold the pick between your index and thumb. Keep remaining fingers lightly curled in and out of the way. The key here is that the curled index and thumb position sort of restricts movement here. We don’t want the fingers moving the pick. 5. Use your wrist’s natural hand wave motion to pick notes. The big wrist muscles, not the thumb and finger, are designed to move back and forth quickly. 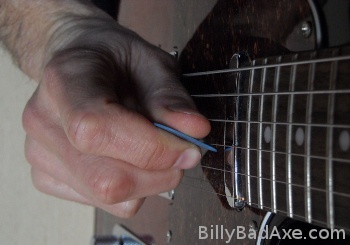 So make sure your thumb and index finger are used only to adjust the step 2 pick rotation angle and nothing else. Let the wrist be the up down motion to hit notes. This tip came from the excellent article by Mark Wingfield here. 6. Move everything up and down without anchoring. Now, with our pick constantly in the correct up/down (90 deg.) and rotational angle (45 deg. ), and using our wrist to move the pick up and down, move this whole “assembly” up and down to access higher and lower strings. This means you can’t anchor your pinky or palm anywhere on the guitar. For higher pitch (thin) strings, rest the side of your thumb and palm on the lower pitch (thicker) strings. As you move toward the thicker strings, move your arm upwards and rest your palm on the body of the guitar above the low e.
Moving the pick hand up and down to play different strings really helped me. I could play the higher pitch strings ok, but if my palm was anchored, when I rotated up to play the lower pitch strings my pick angle naturally went flat making it hard to play. By moving your picking hand up and down, your pick will stay in the perfect position for all strings. While you practice keep a sharp eye out that the angles are correct. I’ll stop and hold my right hand still and then look down the neck of the guitar to make sure my up/down pick angle is correct. Then look straight down on my pick hand to make sure my 45 degree angle is correct. I like to just mute the strings with my left hand and hit notes with my right. Do three or four notes per string and move up and down from high e to low e.
If you practice this and really try to get all the parts working together with nothing left out, you’ll suddenly find that hitting notes will become easier. Once you hit that moment when you are smoother and hitting notes just seems fluid and easy, then you know you are doing it right. When hitting notes feels difficult and the pick is sticking to the strings, then stop and slowly go through the steps again. Carefully reinspect your technique. Angles ok? Wrist motion moving the pick? Not anchoring? Proper technique will put you in that “everything feels right” zone. Once you feel it, you won’t stop until you’ve got it full time. When I played tennis there were times when I could hit the ball as hard as I wanted and never hit it out of bounds. Everything felt right and I could control the ball. The moment things didn’t feel right and I was spraying balls all over the place, my coach would watch and usually find one small thing wrong with my technique. Oh, forgot about stepping into the ball and following through. Once the technical mistake was corrected, I was back to hitting the ball well. Same with guitar right hand picking. If your technique is spot on and all steps are correct, you’ll get into the zone. Be mindful of the small details: pick angles, wrist motion, keeping the thumb and finger fixed, using your arm to move your picking hand up and down. If one is forgotten, it’ll throw a wrench in the works. Classical position is left foot raised with guitar resting on left leg. Some of the shredder guys use the classical position. I like how the guitar is angled up a bit so it is easier for me to get into my perfect 45 deg. pick angle with the right hand, and it’s easier on my left hand because I’ve got better access to the whole neck. This is my new right hand method. I hope you found something here you can use to help your guitar playing as well. Please let me know if this helped, or not! with a family-friendly comment below. This is very useful , thanks! Thanks for the comment. I hope it helps you get a little more speed going. Yep, one of the masters for sure. I'll have to check out his wrist / hand movements. Thanks for the comment. Your technique will get you to moderate speed, but you'll need to intentionally slant the pick (what you called an "upward" or "downward lean") in order to go really fast. This is described in depth by Troy Grady's series, "Cracking the Code." Check out Season #2, Episodes #1 and #2, on Yngwie Malmsteen (they're about 20 minutes each). The major idea is that when the pick reciprocates it goes in and out of the plane of the strings... if this doesn't make sense, Grady will make it clear. thanks for the vid link. interesting stuff! Is it not contradictory to say that a player should not anchor but that they should rest their hand on the strings? And how does one rotate their wrist (as if waving) when their hand is resting on the strings? Would resting it not prevent the rotation? Hi Bill, If you just lightly rest the palm on the strings you can still move your pick hand up and down vertically. There's no right way. I have been trying speed drilling practice since last 2-3 three years in the angle of 90 degree but it gets stick and sometimes and not working properly. what you have mentioned of moving the hands to 45 degree downwords. But i sometimes plant my palm on the bridge and use 45 degree upwords it works good but is it good method. Thank you for passing along those tips. Thanks for your information. is this so helping to the beginner like me. Pick slant simplified: Slant the pick down when you are playing down strokes on the down beat (up strokes are plucked on the up beat obviously, with the pick still slanted down). Slant the pick up when you are playing syncopated up strokes on the down beat (down strokes are plucked on the up beat, with the pick still slanted up). 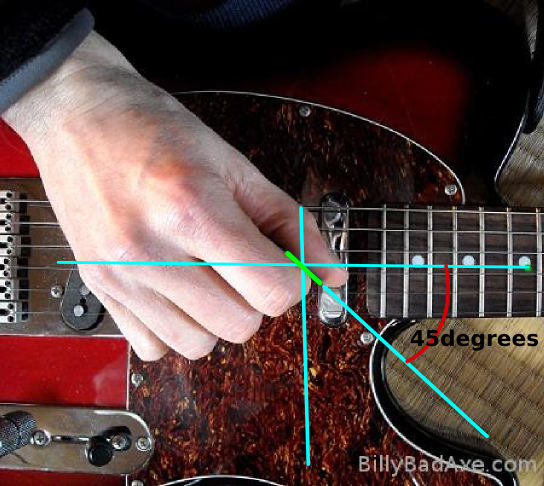 That "45 degree angle" mantra might work with heavily distorted sound where the fundamental guitar tone is already long gone, but it will sound very bad with clean tone, I prefer to have my pick relatively parallel with the string. The trick is to let it wobble a bit by itself. 45 degrees angle is way too much if you want a snappy attack. Particularly critical with clean tone, but I guess you don't care much about that, Mr Badass. I have another good tip regarding picking: Start with the pick resting on the string, and let the string glide off the tip of the pick. It's more of a vety close "rubbing" sensation than anything else. This takes some firmness of the grip, of course. I "float" as well, in that my hand moves up and down depending on the string that is being played. The most important thing in my book, in order to achieve a precise picking depth, and to avoid extraneous movement, is to have a really firm support with your forearm against the guitar body. I ket the forearm push the guitar towards the side of my body somewhat. The flesh in the forearm allows me to move my hand, as long as I find a good sweet spot for it.